AVI is one of universally accepted formats, but sometime you may just want to extract MP3 audio from some AVI formatted files such as lectures, interviews, music videos etc. for MP3 player, iPod, iPhone, or burn into a CD or for audio editing software. There are a host of applications that you can use, ranging from free online video converters with limited size to professional-level desktop AVI video to MP3 extractors. Below is our top-ranked AVI to MP3 converting software, together with guide on how to extract MP3 from AVI files in batch without audio quality loss. 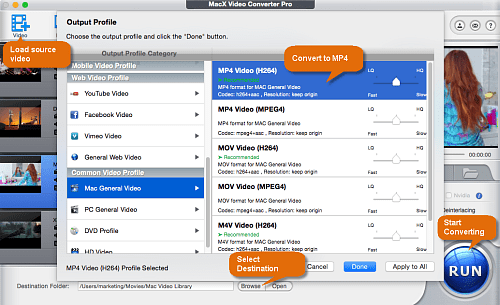 MacX Video Converter Pro is a golden awarded video converter that allows users to convert AVI to MP3, AAC, AC3, OGG, WMA etc. audio formats in batch for MP3 player, audio editing software, iPod etc. mobile devices. Its built-in High Quality Engine promises nearly no audio quality loss during MP3 extracting process. Plus, HT and hardware encoding acceleration tech and Multi-core CPU processing make it the fastest vidoe to audio converter, 5x faster than the self-acclaimed best ones. With easy-to-use interface, this software is simple to understand. It won't take a long time to study the user guide. Before you start with, free download the MacX Video Converter Pro for Windows (Win 10 also supported) or for macOS (macOS Sierra or older) if you haven't already and launch the best video converter for Mac/Windows. Then follow steps below to add source file, choose output and done. Step 1: Click "Add File" button in the upper-left corner. A window will pop up, allowing you to select source AVI files you'd like to convert on your computer. Alternatively, you can drag and drop source files. The best video converter for macOS/Windows enables you to convert multiple AVI files to MP3 audio at a time. Step 2: Select MP3 as output. On the pop-up window, click "to Music" and select the "MP3" option from the list of audio format options, then click "Done". Click Settings icon to further edit output audio file before AVI to MP3 conversion. On the Audio Options section, the best AVI converter houses options to change audio codec, adjust audio channel, sample rate, bit rate etc. audio parameters. Step 3: Select your save location by clicking "Browse" button and finally click "RUN" button at the bottom of the Window to start to extract MP3 from AVI. With support for 370+ video and audio codecs, it also can among SD and HD videos, extract audio from video files, like converting AVI to AAC audio, AVI to MP4, AVI to MOV, MP4 to MP3, M4V to MP3, MKV to AAC, WMV to MOV, FLV to MP4, and more. After the MP3 extraction is finished, you can transfer MP3 music to iPhone, iPad, iPod, iTunes etc. from computer with MacX MediaTrans, an all-in-one file transfer and manager application, which also enables you to convert (DRM protected) music and audiobooks, such as WMA to MP3, protected M4P to MP3, to name a few. MP3 is officially dead in 2017. Is it the best choice to convert AVI videos to MP3 audio format? What about ripping audio from AVI file into AAC (Advanced Audio Coding)? MP3 is not completely dead, at least not now. MP3 vs AAC, MP3 is nearly compatible with any devices. Both AAC and MP3 are compressed formats, AAC comes with better sound quality with the same bitrate compared to MP3 and is the successor of MP3 audio format. Extract MP3 or AAC from AVI Files? If you use iTunes, iPhone, iPod and other Apple devices quite often, we recommend converting AVI to AAC instead of MP3 to get high quality in smaller file size. If you plan to rip CDs in iTunes, converting AVI to AAC is also a better choice. But you won't go wrong with MP3 format that is compatible with nearly every audio player and iPod, iPad, iPhone, Android mobile devices. Free download the best AVI to MP3 converter - MacX Video Converter Pro to convert AVI videos to MP3 on macOS and Windows with nearly original quality reserved in 5x faster speed than other free online audio to MP3 audio extractors, thanks to HT and QSV tech and High-quality Engine.